Another good way to while away an hour or two or three- I found a fascinating website about migration to Britain. Being on the receiving end of wave after wave of British migration, we tend to forget that Britain itself was- and still is- a migration destination. 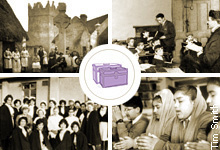 The National Archives are the lead partner in a consortium of other British heritage organisations and museums, and the site contains photographs, stories and timelines of Caribbean, Irish, Jewish and South East Asian migration to Britain.